“It is not deaths and murders and plots and wars that make life tragedy. It is Nothing that makes life tragedy. It is day after day, and year after year, and Nothing. Using royalties from book sales, MacLane left Butte and moved to the East Coast. She was barraged by the press in Chicago and spent time in Greenwich Village, where she reveled in the company of other free-spirited women. She wrote about male lovers and her physical attractions to women. 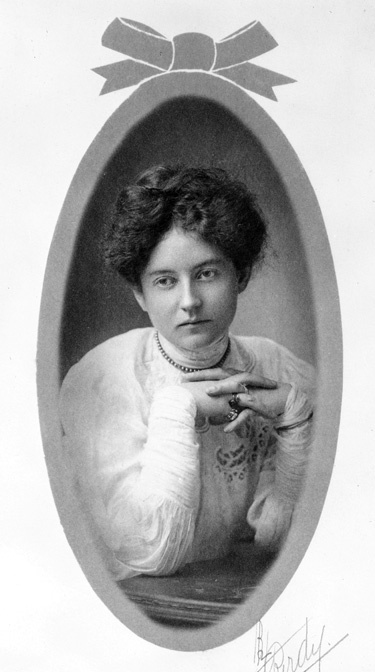 At some time in the late summer or fall of 1902, she met Caroline Branson, the former partner of writer Mary Louise Pool, and began a six-year relationship with her, the only long-term romance MacLane ever had. She published another book in 1903, My Friend Annabel Lee, but it received poor reviews and garnered few sales. Broke and having written nothing of substance for some time, in 1909 she returned to Butte, where she remained for seven years, haunting gambling dens and roadhouses. Betty Horst recalled the time her father, Butte’s health officer, rented a hack to take his wife to a roadhouse for dinner. As they walked through the bar toward the dining room, they passed MacLane sitting at a slot machine, smoking and drinking. She invited Mrs. Horst to join her. When Mrs. Horst accepted, her shocked husband continued into the restaurant. When it sank in that his wife actually knew Butte’s notorious female writer, Dr. Horst got up and drove home. The Story of Mary MacLane has been reprinted and is available in both paper and Kindle editions. It is available for free through the Internet Archives. 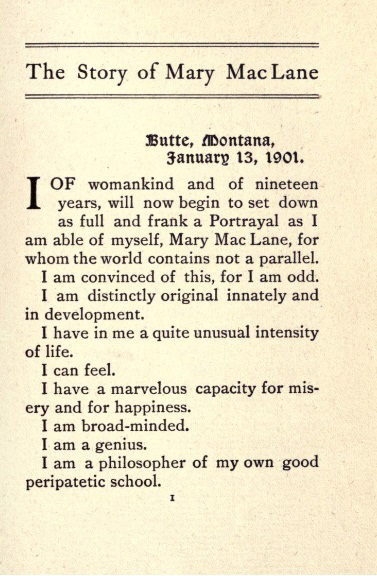 Read more about Mary MacLane in “Mary MacLane: A Feminist Opinion” and “Montana’s Shocking ‘Lit’ry Lady,” both published in Montana The Magazine of Western History. Learn about a few of Montana’s less controversial women authors in Writing a Rough-and-Tumble World: Caroline Lockhart and B. M. Bower and A “Witty, Gritty Little Bobcat of a Woman”: The Western Writings of Dorothy M. Johnson. Halvorsen, Cathryn Luanne. “Autobiography, Genius, and the American West: The Story of Mary MacLane and Opal Whiteley.” Ph.D. dissertation, University of Michigan, 1997. MacLane, Mary. I, Mary MacLane. New York: F. A. Stokes, 1917. ________. The Story of Mary MacLane. Chicago: Herbert S. Stone, 1902. Mattern, Carolyn J. “Mary MacLane: A Feminist Opinion.” Montana The Magazine of Western History 27, no.4 (Autumn 1977), 54-63. Murphy, Mary. Mining Cultures: Men, Women and Leisure in Butte, 1914-1941. Urbana: University of Illinois Press, 1997. Tovo, Kathryne Beth. “’The Unparalleled Individuality of Me’: The Story of Mary MacLane.” Ph.D. dissertation, University of Texas at Austin, 2000. Wheeler, Leslie. “Montana’s Shocking ‘Lit’ry Lady.” Montana The Magazine of Western History 27, no.3 (Summer 1977), 20-33. Martha Edgerton Rolfe Plassmann once wrote that Mary MacLane was fifty years ahead of her time. Young Mary lived her early teen years in Great Falls before her step father moved the family to Butte seeking mining fortunes. The Great Falls newspapers always treated Mary as a home town girl as in the shortened article from the 26 Nov 1902 edition: ”	Mary Elizabeth MacLane A Former Great Falls Girl Who Claims She Is a Genius. Miss Mary Elizabeth MacLane says she is a genius. She lived in Great Falls for five years, and her genius was not suspected by those who knew her in that time, but she was then a bashful schoolgirl, who had not realized her capabilities, and she took no pains to make others believe in her. Her older sister, Dorothy, was considered very bright, as well as the beauty of the family, but a few years have shown that each possesses both beauty and brains, and from Butte, their present home, comes the report that Dorothy has developed into one of the most beautiful girls of the state, while Mary is not only very good looking, but also claims to be a genuine genius. She is a little over 20 years of age now, and she is a seeker after fame, determined to achieve it if she merits it, and she has full confidence she does. The girls are stepdaughters of H. G. Klenze and while in Great Falls lived at 1112 Third avenue north, and attended public schools, both being in the High school when the family left here in the spring of 1896. Both were later graduated from the Butte High school, where each stood very high in her studies. There are also two boys in the family; Jack was a member of one of the Butte companies of the First Montana volunteers and was for a time a color sergeant of the regiment, and Jimmie, the youngest, is now about 18 years of age and very much like his sisters in many ways. . . . This genius of Butte is Mary Elizabeth MacLane, and she lives on North Excelsior avenue. As she has set down in the portrayal: ‘I was born in 1881 at Winnipeg, in Canada, and whether Winnipeg will yet live to be proud of this fact is a matter for some conjecture. When I was three years old I was taken with my family to a little town in western Minnesota, where I lived a more or less vapid and ordinary life until I was 10. We came then to Montana, whereat the aforesaid life was continued. I am purely of the MacLane blood, which is Highland Scotch. These particular MacLanes are just a little bit different from every family in Canada. It contains and contained fanatics of many minds—religious, social, what not—and I am a true MacLane. There are a great many MacLanes, but there usually is only one real MacLane in each geeration. There is but one who feels again the passionate spirit of the clans, those barbaric dwellers in the bleak and well beloved Highlands of Scotland. I am the real MacLane of my generation. The real Maclane in these later centuries is always a woman. You clearly have done some significant research on MM – we should talk. (I just discovered that she and her family lived in Neihart prior to Great Falls.) I trust you’ve heard about out various MM volumes coming out shortly? Love this Organisation. Would enjoy “liking” it on Facebook. Join us on Facebook, Ellen: https://www.facebook.com/montanawomenshistory. Oh, and I just noticed – the link to Leslie Wheeler’s outstanding article actually links to her (also excellent) article on Gertrude Atherton. Corrected! Thanks for pointing out the mistake. P.S. – Check the big new MM website below. Damn. Ghost in the machine. It should be right now.